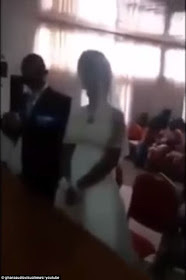 A spurned girlfriend stormed into the wedding of a couple in Ghana... As the couple prepared to tie the knot, the disgruntled secret lover of the groom stormed in and gatecrashed the ceremony. 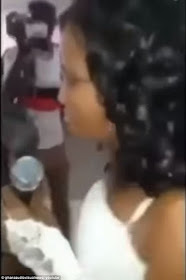 A video of the moment captures the stunned crowd shouting and cheering as the woman – clad in a wedding dress of her own - snatched the microphone and addressed the room. Speaking in a local dialect, the woman – wearing a white wedding dress, white net veil and white gloves - apparently told guests the groom was a philanderer, according to the Mirror.